When making your purchase with PAYPAL, be sure to note which location you will be using to pick up your share. This is a one time delivery. 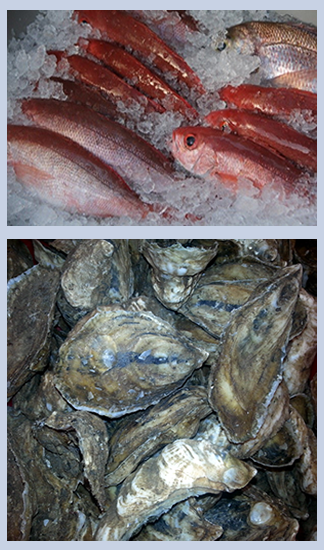 You will have the option to purchase fish and/or oysters. The fish for this delivery will be Vermillion Snapper and/or Triggerfish. These fish will be caught using hook and line in the Atlantic Ocean. It is uncertain to the exact species that will be caught. Please specify on the Paypal page how many pounds of fish you would like to receive. When ordering the oysters, please indicate how many bags (12 oysters per bag) you would like to receive. If you are unable to pickup your share, please make arrangements with someone else to pick-up your seafood. We are unable to compensate you for missed shares. For your convenience, there is a message board on our website in the Member's Forum page where you can swap/trade/buy shares from other members. Please make your arrangements directly with the other members. North Carolina's weather is often unpredictable and there may be times when weather prevents fishing. If weather prohibits the fresh catch, we will let you know as soon as possible and reschedule for the following week. If a pickup is cancelled or delayed, you will be notified by email.